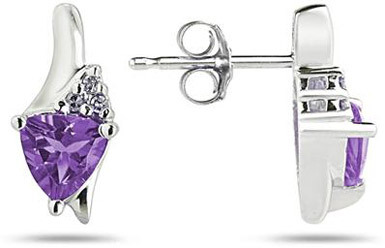 Trillion shaped amethyst earrings with round diamonds are made in 14K white gold. Trillion shaped gemstones measure 5mm and weigh 0.85 total carat weight. Earrings come with push back posts. We guarantee our Trillion-Cut Amethyst and Diamond Earrings, 14K White Gold to be high quality, authentic jewelry, as described above.